My old mouse (Logitech M515) suddenly decided to stop working last week. When it stopped working, I thought I simply need to replace the batteries. The old Duracell batteries inside was leaking some liquid and crystal chemicals. The bottom side of the AA battery turned black. I tried to clean everything, then installed a new pair of batteries. The LED indicator in M515 got turned on for few seconds, then it turned off again. The mouse never worked, even in the few seconds when the LED was on. Since I failed to have a working mouse, I checked my new batteries again, and surprise, the brand new battery was leaking chemicals too, only within few seconds of use. At that point, it became clear that this I need to replace the mouse with something new. 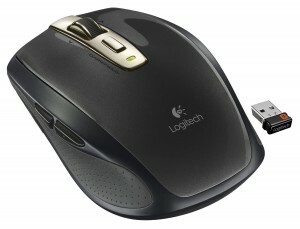 I have used Logitech M515 for many many years. This last unit lasted around 3 years, but the previous mouses I owned were also M515. So every-time an M515 needs replacement, I got myself a new M515. The reason for replacement was usually about the left-click button acting strangely (sometimes does not register a click, sometimes my single-click became double-click automatically). This is the first time Logitech M515 destroyed new pair of batteries. I am not sure if this is an issue from the mouse, or I happen to buy poor quality batteries. After many years of using Logitech M515, I decided that now is a good time to change. So I searched alternative models with similar features. I like Logitech-style two options of scrolling (step-by-step scroll and hyper-fast scroll). I like M515’s middle button which allow me to choose between windows from an opened app in my Mac OS X. So the new candidates would be from Logitech as well. 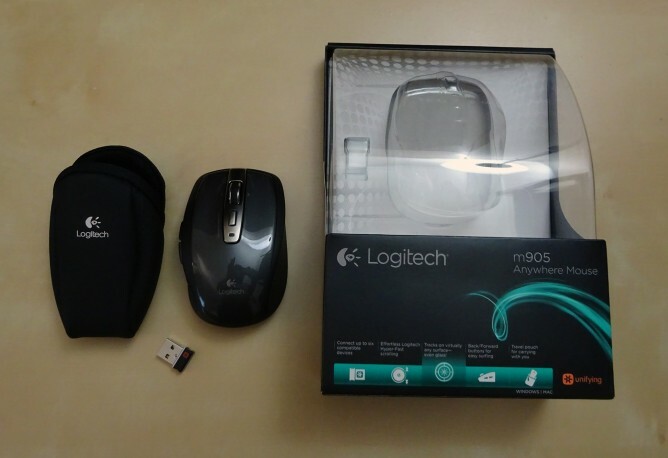 Wireless mouse from Logitech with two-scroll methods and middle buttons are M705, M905 and M950. M705 looks good with sculpted design with extra buttons; one set of battery could lasts 3 years. M905 looks similar to my old M515, but it has additional 2 custom buttons and it uses DarkField technology, allowing us to use the mouse virtually on any surface. I quickly remove M950 from my candidate list because I think it’s too big. After 2 days of research, I decided to get M905. Logitech M905 Anywhere MX mouse looks nice with shiny surface. It features Logitech’s usual two-styles of scrolling, a middle button, plus 2 custom buttons positioned below our thumb when we hold the mouse. All the buttons are customizable using additional software from Logitech. I downloaded Logitech Control Center software for Mac and turned out it is not really compatible with OS X Yosemite. It works fine with my wife’s computer running Mavericks, but runs glitchy in my Mac. It’s a shame that Logitech has not released a new version for Yosemite after months of the OS release. If you plan to buy new Logitech mouse hoping to fully use all custom buttons in Mac running Yosemite, you better think twice. Despite my initial frustration with the incompatible software, I ended up uninstalling Logitech Control Center from my Mac and simply use M905 without any Logitech software. Surprise, it performs much better. The middle button works as expected. The custom buttons below my thumb performs various action based on the location where I press them. When I press them on a web link, it opens that URL on a new tab in my browser. When I press the button on a Firefox tab, it closes the tab. At worse I can just ignore these buttons, but it seems to me that some of the behavior might actually be useful. According to Logitech website, one set of new battery could last up to 4 months with this mouse. Significantly shorter compared to M705’s three years promise, but completely understandable given the different tracking technology (DarkField). Plus, after my last set of batteries got fried up inside my old mouse, I kinda like the idea of 4 months duration instead of 2 years duration (M515 promises 2 years usage for one set of batteries). 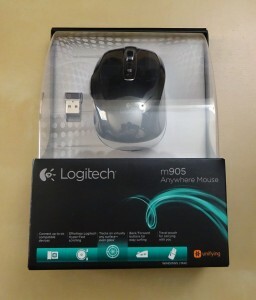 For wireless connectivity, M905 uses the usual Logitech unifying receiver. I already has a dedicated USB lost for the receiver, so it can immediately replace my old M515’s receiver. Some online reviews mention that M905 is heavy, even with one battery. Personally I don’t have any issue with M905’s weight. It’s a perfect weight to work with my desktop Mac, or with my Macbook Pro. This mouse comes with a carrying pouch, which I found quite unusual. It’s not really useful for me, but it certainly looks really nice. The experience of using M905 is nice and enjoyable. The click feels better than M515. 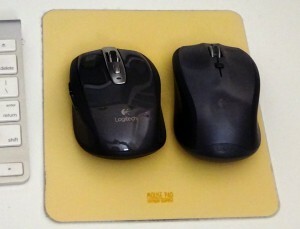 The mouse design is slightly thinner than M515, which bring the need to adjust my habit. A bit less comfortable compared to M515, but not a deal-breaker and I can still live with it. The scroll feels exactly the same, the middle button has softer feeling compared to M515’s middle button and I love it. The extra buttons around my thumb are useless most of the time, but I think I can get used to ignoring them. A short test using M905 on glass surface went reasonably ok. Overall, I am happy with this purchase. I hope this mouse will last longer than my previous M515 and will help me a lot in my productive work. It’s a pitty, This mouse can’t working well with OSX Yosemite. . . .